MARION — Let the second season begin. 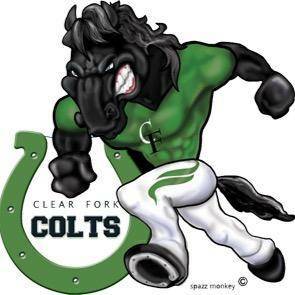 Clear Fork ended the regular season with a sound 48-14 defeat of Marion Harding Friday night. By all indications the Colts will host Bryan in a Division IV first-round playoff game Saturday at 7 p.m. at the Colt Corral. The Colts got four first-quarter touchdowns and took a 28-0 lead, building it to 42-14 by halftime. This marks a second-consecutive perfect regular season finishing 10-0 and 7-0 in the Mid-Ohio Athletic Conference. The Presidents ended up 2-8, 1-6. Bryan brings a 7-3 record into the game with the Colts. A 41-7 win over Evergreen last Friday night was needed to secure the 8th and final playoff spot. Clear Fork won its opening round game a year ago before falling to Bellevue at Arlin Field in Mansfield. The Colts opened the scoring with 7:17 left in the first quarter on a 6-yard TD pass from Jared Schaefer to Trevon Trammell. They made it 14-0 about two minutes later on a 16-yard pass from Brennan South to Caden Flynn. A 9-yard TD run by Lucas Kern made it 21-0 and Clear Fork added its fourth first-quarter score on a 28-yard pass from South to Flynn with 12 seconds left. After the Presidents scored, Clear Fork extended its lead to 35-7 with 2:55 left in the first half on a 10-yard run by Kern. Harding added another score to make it 35-14 before Flynn ripped off an 81-yard kick-off return to make it 42-14 at the half. Clear Fork closed the scoring on a 49-yard pass from Schaefer to Flynn with 11:34 left to play in the third. Trammell finished with 194 yards on 21 carries. Schaefer and South combined to complete 9-of-18 passes for 179 yards. Flynn had five catches for 137 yards and three scores.